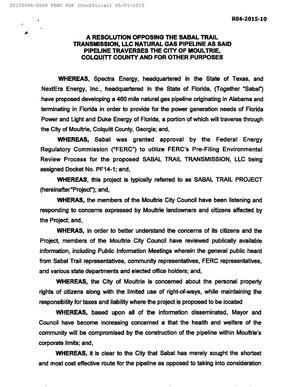 WHEREAS, based upon all of the information disseminated, Mayor and Council have become increasing concerned a that the health and welfare of the community will be compromised by the construction of the pipeline within Moultrie’s corporate limits; and. 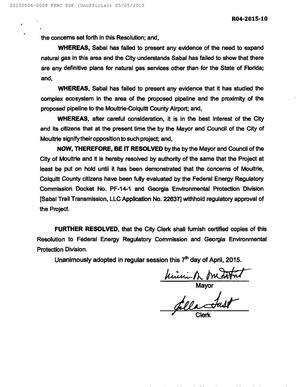 NOW, THEREFORE, BE IT RESOLVED by the by the Mayor and Council of the City of Mouttrie and it is hereby resolved by authority of the same that the Project at least be put on hold until it has been demonstrated that the concerns of Moultrie, Colquitt County citizens have been fully evaluated by the Federal Energy Regulatory Commission Docket No. PF-14-1 and Georgia Environmental Protection Division [Sabal Trail Transmission. LLC Application No. 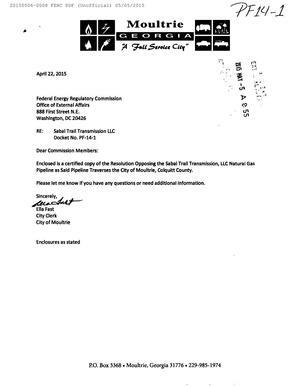 22637] withhold regulatory approval of the Project. 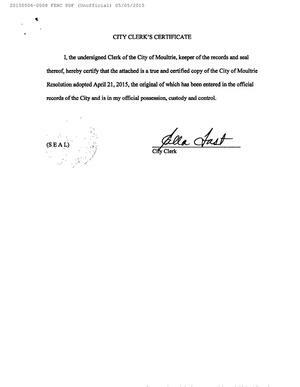 FURTHER RESOLVED, that the City Clerk shall furnish certified copies of this Resolution to Federal Energy Regulatory Commission and Georgia Environmental Protection Division. Unanimously adopted in regular session this 7th day of April, 2015.